We’d love your help. 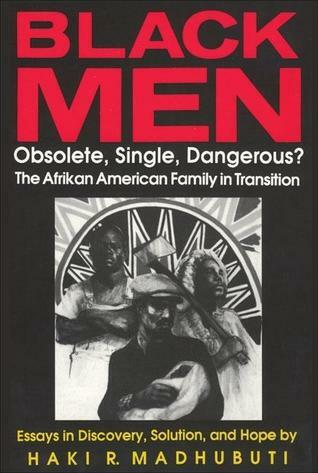 Let us know what’s wrong with this preview of Black Men, Obsolete, Single, Dangerous? by Haki R. Madhubuti. To ask other readers questions about Black Men, Obsolete, Single, Dangerous?, please sign up. Be the first to ask a question about Black Men, Obsolete, Single, Dangerous? This is the book that started me on my road to transformations. Elder Haki Madhubuti's work is a must read for those who about serious change. This was a thought provoking and inspiring book. It was educational and entertaining. Every Black man and the women who love them should read this book. I began this book at Howard University but never finished it. The author lays out a road map for Black male empowerment. There are chapters on parenting, relationships and faith among many others. The shooting of the unarmed Man in Charleston yesterday makes me want to read this again. This book was different. It brought a new inside appearance of the Black man struggles. I think all people should read. This book was for a women's study class in college. A great examination of the Black male experience in America. One of the best books ever. Ever. excellent book. inspired me to be a more productive husband father and man.